1. Put the courgettes in a colander in the sink; toss with the salt. Drain for 30 minutes, then shake off any excess water and tip onto a clean, dry tea towel. Wring out over the sink to remove as much water as possible. Preheat the oven on its lowest setting. 2. Crush the chick peas in large mixing bowl using a potato masher or the back of a fork. Add the courgettes, flour, baking powder, salad onions, red chilli, lemon zest, eggs and 2 tbsp shredded mint. Season and mix well. 3. Put a large, non-stick frying pan over a medium heat. Add ½ the oil, then add heaped tablespoons of the mixture, well-spaced out, to make 6 fritters. Fry for 2-3 minutes on each side, flipping with a spatula when golden. Put on a plate lined with kitchen paper; keep warm in the oven. Repeat with the remaining oil and mixture. 4. Combine the tomatoes and feta with the reserved 1 tbsp shredded mint and season. 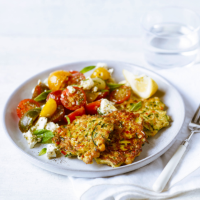 Serve alongside the fritters with lemon wedges and extra mint leaves.